The number of denied FEMA applications highlights the island's history of illegal construction and poor development. New grants may help change that. CANÓVANAS, Puerto Rico — Every time Miriam Medina looks at her roofless, weak, wobbly house, she’s reminded of all her failed attempts to receive aid to fix it. Medina said she has lost count of all the times FEMA denied her individual assistance application because she couldn’t prove to them that she owned the home that was destroyed almost eight months ago. Her house sits on a piece of land Medina bought for $1,500 almost two decades ago, eventually building a home there alongside her ex-husband. “FEMA doesn’t recognize any of that,” she said, because she doesn’t have the property title to her home. In order to be eligible for FEMA aid under the individual assistance program, applicants need proper documents to provide proof of home ownership. The number of denied applications highlights a bigger issue confronting the island — a history of illegal construction and poor housing development, mainly in poorer communities. Though there are no official government figures on the number of houses built informally, a conservative estimate suggests that around 260,000 houses in Puerto Rico were built without the appropriate legal documentation and permits, according to David Carrasquillo, president of the Puerto Rican Planning Society, a private entity that brings together urban development experts. But previous estimates from the Puerto Rico Builders Association, an industry group, suggest that about 55 percent of the island’s infrastructure — more than half — was informally built, including 700,000 houses and commercial buildings. These practices go back generations. “In rural areas, sometimes you have a grandpa who owned a land that was passed down generation after generation and they never registered the property,” said Michelle Sugden-Castillo, a housing nonprofit consultant in Puerto Rico. A lot of these pieces of property go by a family's name, but they still lack the proper paperwork. For federal aid purposes, this kind of evidence is not enough. Some kind of paper trail evidence such as deeds or leases, mortgage payment booklets and property tax receipts, among other documents, are imperative for the FEMA application process. Sugden-Castillo said issues over clear title transfers — paperwork that clearly shows that a piece of property went from one homeowner to another, even if it's just a relative — can result in unclear evidence that can hurt people’s chances of receiving FEMA aid. If none of the documents proving clear home ownership exist, in some cases FEMA may accept a signed letter that describes how long the applicant has lived at the disaster-damaged home and an explanation as to why the proper documents are unavailable. Other forms of aid are available if this application process fails, such as low-interest disaster loans and grants under the Other Needs Assistance program (ONA). Applicants also have a chance to appeal any FEMA decision. These changes have helped people get aid that they may have not received otherwise. But Puerto Ricans who live in communities that were informally built and without permits on government or privately owned lands continue to have a hard time navigating FEMA’s hurdles. Barrio Palmarejo, where Medina lives, is one of the many communities in Puerto Rico built as squatter settlements. In this case, families originally settled on the wetland in Canóvanas, about 27 miles east of San Juan, after 1989 when Hurricane Hugo displaced many residents from their homes. Over 5,000 people currently live there. This panorama exists islandwide. Neighborhoods like Canteras and Caño Martín Peña in San Juan also have communities that established themselves on public lands more than 80 years ago in the aftermath of Hurricane San Ciprián. Gov. Ricardo Rosselló and Fernando Gil Enseñat, Puerto Rico’s housing secretary, granted 300 lease subsidies and 62 property titles to families in 26 municipalities whose home ownership status was not recognized for years. “Granting property titles is vital, so people can receive individual assistance to repair thousands of homes affected by these atmospheric phenomena," said Enseñat at the event. 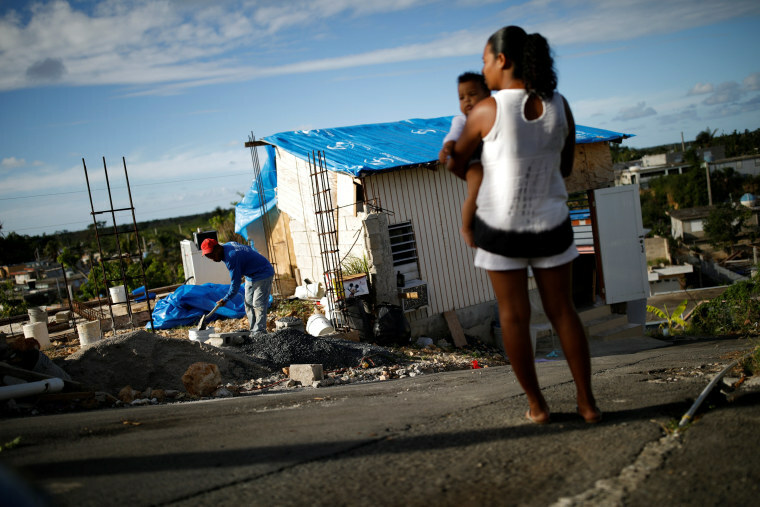 Acknowledging the aftermath of the hurricane and the need to tackle the issue of informal housing, the U.S. Department of Housing and Urban Development (HUD) gave Puerto Rico an $18.5 billion grant, the largest single amount of disaster recovery assistance awarded in the agency's history. It had also allocated $1.5 billion to the island in February — bringing HUD’s total investment in Puerto Rico’s recovery to $20 billion. Public officials have said they hope to use some of the funds to tackle the issue around informally established houses and communities, such as Barrio Palmorejo. “These public funds could be used to deal with the issues caused by floods and the issues around property titles,” Jeniffer González, Puerto Rico’s nonvoting representative in Congress, said during the announcement. Puerto Rican officials have to comply with a strict protocol that includes public hearings and clear public plans in order for HUD to disburse the funds, meaning that it will be several months before Puerto Rico can actually spend the money in reconstruction efforts. There is no guarantee that Medina's community, Barrio Palmarejo, will directly benefit from the HUD grant. But the town’s mayor, Lornna Soto, hopes some of the money can be used to build a dike to mitigate the area's aggressive floods and eventually rebuild the community within the island’s legal housing framework. In the meantime, Medina is living across from her destroyed home in a one-bedroom apartment that she shares with her two grandsons, still without power and with the water damages María left behind. She remains hopeful that help will come. Nicole Acevedo reported from New York and Istra Pacheco from Puerto Rico.